There are now bookmarks and mooch cards available in the UK. That’s right, if you live in the UK, you can now mooch bookmarks and mooch cards. The bookmarks are available in boxes of 125 each. The mooch cards are available in boxes of 250 each. There was an extended discussion on this blog a few days ago about how much BookMooch costs to run and many of you noted that printing costs are the biggest expense, and wondered if that was wisely spent money. Because of that discussion, Gill (who has volunteered to send these out) and I talked it over, and we decided to that we should send out smaller quantities of the printed materials to make them go longer. Also, I’m nudging people to give a little (if they can) when mooching these printed materials, in order to help cover the printing costs. It’s also my hope that many of you will offer the bookmarks you receive in smaller quantities, for mooching by people on the European Continent. I’d like it if the cards spread there as well. There are also a few boxes on their way to France right now, where they’re be available for mooching in a week or so (I’ll blog about that). Be sure to give Gill a smooch to thank her for mailing hundreds of packages, as she is going way beyond the call of duty! She also helped find this printer and picked up the boxes herself, to help avoid shipping costs. Also, thanks to everyone who has given a little, as your donations are paying the postage to send these out, so that more Europeans (and Brits!) can join in the big mooch. My recent blog entry on How much BookMooch costs to run generated a huge volume of comments, and I wanted to respond to what people suggested there. You might want to read some of those comments before reading the body of this blog post. (c) focus on making BM free and great. That fundraising effort has been totally successful, and I can say now that BookMooch is on a firm financial footing, and isn’t in any danger. Many of you have signed up to give a little each month, and that has raised about $1700 every month. On top of that, I’ve received about $5000 in one-time gifts. Add to that the $12,000 I get from Amazon for books you buy there, and I’m looking at a yearly budget around $35,000. One of the reasons I focussed on monthly gifts was so that I could live within a dependable budget, rather than having to continually hit you up for donations. Maybe I’m naive, but couldn’t you save that $5K by cutting back on bookmarks? I mean, they’re great and all, but wow, twenty grand? I agree. I detailed the costs of running BookMooch and my biggest expense has been printing bookmarks and mooch cards, an expense that I can cut way back if the budget doesn’t allow it. That’s what I’m planning on doing. I use postcardpress and nextdayfliers in the USA, and Printit in the UK. You can use them, or any printing company you like. What I suggest for moochers in Germany, the Philippines and other countries who want cards, is that you raise money locally or from other moochers internationally and print them locally. I think this makes a lot more sense than me doing everything centrally, and also because printing costs are just too high for me to have cards & bookmarks printed all over the world. a) paypal already offers this feature, and does it well. So does Endicia and eStamps. In the UK, Royal Mail lets you print stamps over the web. Since big companies already do it well, why duplicate the effort? e) I would have to ask for your credit card or paypal account, which would completely transform your relationship to BookMooch (into one where I charge you money). As an FYI, Endicia does offer a referral program, with a small payment to the referrer, but I’m very reluctant to turn BookMooch into a “buy here!” and “click here!” and “great offer!” kind of site. Ugh. I really like how uncommercial BookMooch is, and I feel that once you start pushing someone else’s company and products, it’s a slippery slope to crass commercialism. 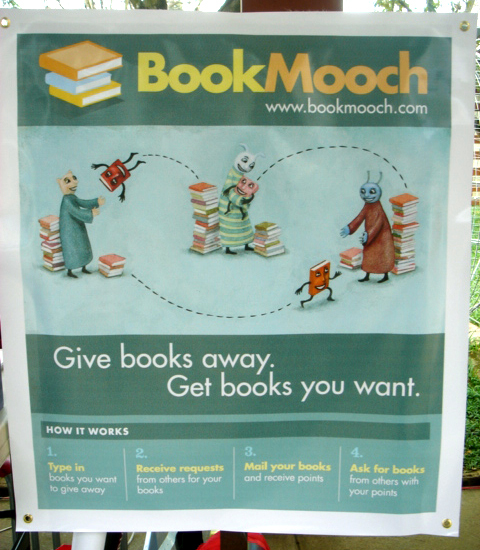 The idea of BookMooch selling book points for cash was also raised. I’ve always been philosophically against this idea: I think the “golden rule” of “give and you will receive” should apply at BookMooch, and I don’t want people to be able to bypass giving by paying me money (which feels like a bribe to me, honestly). Besides, if people could buy points and receive books without giving, that would deplete the overall diversity of the BookMooch book catalog, since books would be removed without any being added. BookMooch mugs have been offered in the past, and I think I have sold 3 of them. You might think that people want to buy mugs, but they don’t really. Two years ago I bought a dozen of them and sent them as xmas presents to my volunteers. Also, the profitability on a mug is terrible: I make something like $2 of profit from each coffee mug and $1 from each travel mug. It’s much better to just ask you to send $3. I’d love to be proved wrong, and to sell a bunch of them <grin>. Google is pay-per-click. With the same members coming every day, it’s likely that the ads wouldn’t get clicked on that much as the same people would see the same ads every day. Also, if you look at how much information each page at BookMooch has to display, I would have to cut back on that pretty significantly to find space for advertising. I thought about perhaps having ads on the non-member section of BookMooch, so that members wouldn’t have to suffer them. However, the vast majority of use of the site is by members. I won’t rule advertising out in the future, but it’s something I’d rather not do. I’d be much more likely to do something book-related, such as suggest a “best price” for each of your wishlisted books from used book stores on the Internet. That would add value to the site, by helping you buy books you want at a cheap price, and cause some revenue due to increased book sales. Oh no, please… BookMooch must not become like the other guys! Much of what makes BM great is that it is really and truly free to use – no transaction fees, convenience fees. Nobody here wants my credit card number. I completely agree, and the donations you’ve given have ensured it’ll stay that way! I checked my postal mailbox today, and found 32 donation checks waiting. Wow! Even better, a lot of them included fantastic and cute little notes. I thought I’d share some of them (this is just a small sample). What a great sunday: I’m in a super-good mood from all this happy, happy love! I received this very nice email today from Reader To Reader http://readertoreader.org/, which is a registered BookMooch Charity. They’re simply saying “thanks!” and I thought I’d share their message. They don’t need more points, however, as moochers have been very generous to them and they’ve received over 2200 books from the mooching community. It’s amazing and wonderful that we can help in this way! I just wanted to write and thank you on the behalf of Reader To Reader. I have been SOOO impressed at how generous bookmoochers have been to us. As you know, we are a non-profit and we get books to the neediest schools and libraries in America. We like to match specific needs and we use Bookmooch to find particular books that they need. If possible I always try and mooch more than one book from each member since I am very aware of mailing costs. But in the last few months I have been just amazed at how generous bookmoochers have been–donating back points, sending extra books, sending heartfelt messages. There are many really wonderful members. And thank you to you especially for this wonderful site that has been such a huge help and inspiration! I crunched the Amazon numbers and found that in the past twelve months, I’ve received $13,192 from Amazon. In the 12 months before that, it was $10,854 (ie this year was a 20% increase). Amazon pays 8% when you buy a book after clicking on the “Amazon info” button at BookMooch. Note that Amazon was paying quarterly back in 2006/early-2007, which is why the 1/5/07 payment is 3x larger than the others around then. The current shortfall is quite small, just $5000 per year. I need 100 new subscriptions at an average of $4/month each (I currently have 293 subscriptions). Alternatively, if Amazon sales were as high every month as last month, that would do it too. I’m not asking to earn that $70,000 back: that’s my contribution to getting BookMooch to this point. However, to make BookMooch permanently sustainable, I realized that I needed your help, and you’ve been really generous in providing it. If you haven’t given a little yet, maybe now that you see how all this works, you’d be willing to? A number of people (including me!) wanted to know how the BookMooch fundraising was going. Last night, I crunched the paypal logs in order to get a total in US Dollars that has been raised (ie converting Euros and Pounds to US Dollars). From the emails I’ve received, I’m expecting to raise another $2000 from checks that are being postal mailed. BookMooch gets about $1000 a month from Amazon for book sales by BM members (sometimes I get $800/month, sometimes $1200/month). The good news is that I’ll be able to pay off the $10,000 server in about 2 1/2 months, adding together one-time and subscription gifts. In the past 2 months, I spent about $20,000 printing bookmarks and mooch cards and postal mailing them. I’ve only mailed 2/3rds of the bookmarks: the remaining 250 boxes of bookmarks are in my garage in California, and I plan on making them last the rest of the year. That means subscriptions for the year and the donations I’ve received so far will pay for the new server in 2 1/2 months, and the rest of the year in subscriptions will pay for the bookmarks. I’m now covering most of BookMooch’s expenses. However, I have another $10k/year in costs to run BookMooch each year which I haven’t yet raised money for. This expense comes from a variety of sources, such as the server hosting fees, paying for mooch stands around the world, and other miscellany. So… I’m still looking to raise subscriptions by another $1000/month, or to get $10,000 in one-time donations. However, I’m *much* better off than I was before asking for your help, and have a comparatively much smaller shortfall now. Last week I blogged about how I was asking for donations to help me buy a new server for BookMooch, as the present one is now at 87% capacity. I received a whole bunch of postal mail with checks, about $500 worth, which is great! I’ve raised about $1500 so far, which is fantastic, but a long way from the $10,000 this server is going to cost, so please do give a little if you can. I really do need the help to keep BookMooch sustainable (it does cost something to run this service, since I do run it for free). Here are two wonderful letters (out of a bunch!) that I received, that I wanted to share. I love the love that mooching engenders! Moocher Aaron McBride has been running the Unofficial Bank of BookMooch since April 2007. I thought I’d blog about it, as it’s quite interesting and has come a long way. The Bank’s bio page at BookMooch has a good overview of how the bank operates, as does the BookMooch wiki page for it. Unofficial BoB is here to lend people points so that they can get a book that they really want. This will then make more points available to more people and help keep books moving. On a more human side, I’ve been really impressed with how many people have been willing to donate points to the bank (over 40). I’m also happy to see my suspicions confirmed that people are good and honest. I haven’t had any serious cases of abuse, and have seen a fairly low delinquency rate. One other thing worth mentioning is that the bank’s mode of operation has changed quite a bit from when it first launched. Originally, the bank accepted deposits and would grant withdrawals against those deposits. The bank could then use the deposited points to grant loans, and so long as there wasn’t a run on the bank, everything would continue smoothly. It turns out that enough people made donations (not expecting to ever have those points returned) that I was able to fully pay back all of the deposits and run the loans purely out of the pool generated by deposits. I’m so “over funded” at this point that I’m not asking for donations anymore. Another thing that has changed is that I’ve stopped requiring that members have positive feedback to get a loan of more than one point. Now, anyone can get a loan of up to three points by simply clicking a few links and filling out a form. While the bank isn’t right for everyone, I suspect that there are a lot of people out there that could benefit from it, but don’t know that it exists. I sent Aaron a smooch, to thank him for this really cool side-project! Many, many of you have asked me to add a “donation” button, so you could help BookMooch grow by giving a little bit of money. You will now find a “Give” button in the main member menu. Any questions, please ask away on this blog entry. I’ve made a page at BookMooch all about this new “Give a little” idea. I received this great email this morning from Patti in the Philippines. I love the t-shirts, and it’s wonderful that there are so many moochers in the Philippines. Fantastic! I sent them all smooches, you should too! I would like to tell you how our BookMooch stand at a high school fair went. Teresa Malango sent us a kit a couple of months ago and we were able to use it for this event. It was held at the Ateneo de Manila High School (Quezon City, Metro Manila) last January 30, 2009. We were there the whole day. Besides putting up the MoochStand kit Teresa sent us, I also had a BookMooch tarpaulin made. I also made and printed out several copies of BookMooch Information Sheets, which provided more information on how to join, how to send books, and basically, what BookMooch is all about. Most of the information I just borrowed from the About section on BookMooch. And because we love BookMooch so much, I had my sister (who silk-screens t-shirts) make BookMooch shirts for us. You can see me (and another BookMooch member) wearing the shirt in the photos I attached to this email. 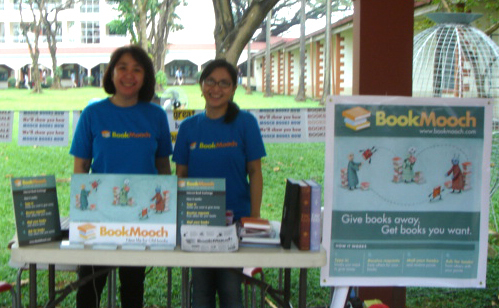 With me at the BookMooch Stand at the Ateneo HS fair was Triccie, another member on BookMooch. She’s libreria. She used to be a bookstore owner, so to help recover the cost of the booth fee, we sold her left-over inventory on the side. Triccie is just awesome. She brought everything we needed to set up, like the tables, chairs, and transportation. 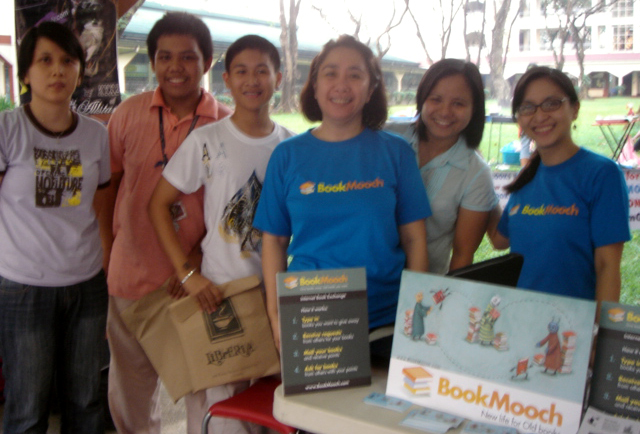 A few hours later, Joel (BM id: joelg) joined us to help promote BookMooch. Our stint at the high school was a success. We met several high school students who are so in love with books. Some already joined and I am helping them get settled in on BookMooch. We also talked to a lot of teachers and parents who are excited to be exchanging books all over the world. 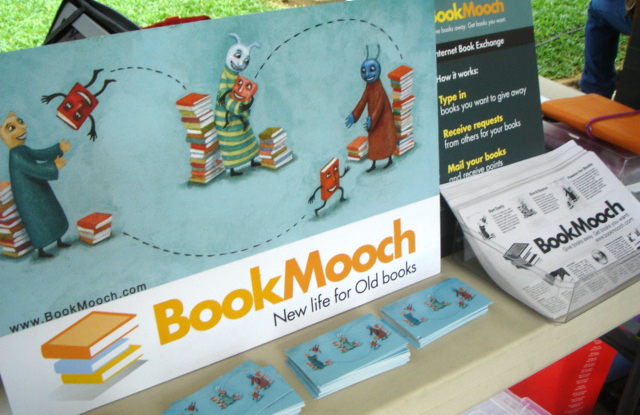 For our next BookMooch stand, we are looking to join neighborhood bazaars and maybe the Manila Book Fair in September. We’ll see how that goes. Until our next BookMooch Stand! P.S. The photos are a little blurry, though—sorry about that. BookMoochStand (4) – Triccie and me with some of the students and teachers who are interested in BookMooch! P.P.S. We are a close bunch here in the Philippines. In the last 3 months, we have had 4 BookMooch parties held at Triccie’s home. I remember that I was so excited to be meeting BookMooch members in the Philippines for the first time (I joined in August 2007 and only in November 2008 was I able to meet almost everyone!). We spend the afternoon and evening talking about books, playing games — our favorite is BookMooch Jeopardy, having a book swap (like a White Elephant swap), and just enjoying each other’s company. We’ve all gotten so close that we also scheduled book excursions: we went to a city that’s about 1-2 hours away to go book shopping at their warehouse. We also spent another day bookstore-hopping! We always finish the day with bags of books to bring home. Next time, we might go Tagaytay, a popular vacation spot, and just relax and have fun. Thanks to BookMooch, I found so many friends with the same interests as mine. BookMooch is awesome!